The state of North Carolina offers a wide variety of fishing opportunities. Here, you can fish for largemouth bass, smallmouth bass, spotted bass, redeye bass, channel catfish, flathead catfish, blue catfish, white catfish, black crappie, white crappie, walleye, rainbow trout, brook trout, brown trout, bluegill, flier sunfish, green sunfish, pumpkinseed sunfish, redbreast sunfish, redear sunfish, warmouth, white bass, white perch, yellow perch, kokanee salmon, stripers, steelhead, bowfin, chain pickerel, longnose gar, muskie, northern pike, sauger and tiger muskie in local lakes, rivers, ponds and/or streams. Visit each NC lake page for details on species within that lake. This chart shows the major fishing waters in North Carolina, cross referencing these waters with the major types of fishing to be found in each of the lakes or impoundments. For a more complete list of fish species in North Carolina, see the list below, which also includes state records. Apalachia Lake is an 1,100-acre lake in the south-west corner of the state, 5 miles west of Murphy, NC. Badin Lake is a 5,000-acre lake in the central part of the state, at New London, NC. Belews Lake is a 3,860-acre lake, located in the northwest part of the state, at Pine Hall, NC. Blewett Falls Lake is a 2,560-acre lake in the south-central part of the state, at Rockingham, NC. Chatuge Lake is a 7,480-acre lake in the southwest corner of the state, at Hayesville, NC. Falls Lake is a 12,400-acre lake in the northeast part of the state, on the northeast outskirts of Durham, NC. Fontana Lake is a 11,700-acre reservoir located in the western part of the state, at Almond, NC. Harris Lake is a 4,100-acre reservoir in the northeast part of the state, 5 miles east of Moncure, NC. High Rock Lake is a 15,180-acre lake in the north-central part of the state, 5 miles south of Lexington , NC. Hiwassee Lake is a 6,200-acre reservoir in the southwest corner of the state, at Murphy, NC. Hyco Lake is a 3,750-acre lake in the north-central part of the state, at Semora, NC. Jordan Lake is a 14,000-acre reservoir in the north-central part of the state, 5 miles west of Cary, NC. Kerr Lake is a 50,000-acre reservoir located on the northern border of the state, at Middleburg, NC. Kings Mountain Reservoir is a 1,500-acre lake in the south-west part of the state, at Shelby, NC. Lake Gaston is a 20,000-acre reservoir on the northern border of the state, 2 miles north of Littleton, NC. Lake Glenville is a 1,470-acre lake in the southwest part of the state, 5 miles southwest of Creswell, NC. Lake Hickory is a 4,200-acre lake located in the north-central part of the state, at Hickory, NC. 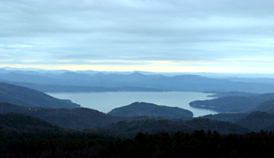 Lake James is a 6,800-acre reservoir in the north-central part of the state, at Nebo, NC. Lake Mattamuskeet is a 40,000-acre reservoir near the eastern edge of the state, at Fairfield, NC. Lake Nantahala is a 1,600-acre lake in the south eastern section of the state, in the Nantahala National Forest, nearby Aquone, NC. Lake Norman is a 32,000-acre reservoir in the north-central part of the state, at Mooresville, NC. Lake Rhodhiss is a 3,000-acre lake in the north-central part of the state, at Rhodhiss, NC. Lake Tillery is a 5,200-acre lake located in the central part of the state, at Norwood, NC. Lake Waccamaw is a 8,900-acre lake in the South-east part of the state, at Lake Waccamaw, NC. Lake Wylie is a 12,000-acre reservoir on the southern border of the state, at Belmont, NC. Mayo Reservoir is a 2,800-acre lake in the north-central part of the state, 5 miles north of Roxboro, NC. Mountain Island Lake is a 3,200-acre reservoir in the southwest part of the state, 3 miles west of Huntersville, NC. Moss Lake is a 1,500-acre lake in the southwest part of the state, at Shelby, NC. Phelps Lake is a 16,600-acre lake in the northeast part of the state, 2 miles south of Creswell, NC. Randleman Lake is a 3,000-acre reservoir located in the central part of the state, 10 miles south of Greensboro, NC. Roanoke Rapids Lake is a 4,600-acre lake located in the northeast part of the state, at Roanoke Rapids, NC. Santeetlah Lake is a 2,880-acre lake in the western part of the state, at Santeetlah, NC. Santeetlah Lake is a 1,300-acre lake in the western part of the state, at Santeetlah, NC. Shearon Harris Reservoir is a 4,100-acre lake in the north-east part of the state, 5 miles east of Moncure, NC. W Kerr Scott Reservoir is a 1,475-acre lake located in the north-central part of the state, at Wilkesboro, NC. Visit AA-Boats-Boating.com to find information about fishing boats in North Carolina and other boating information. Apply for a North Carolina fishing license. Visit the NC Wildlife Resources Commission website for additional information about fishing in North Carolina.